Why do people on the phone think they can use GDPR in the same bonkers way they used to use the DPA 1998? Probably because most of the people they talk to have never read it. Info at 9:50, Jul 27: Thank you for choosing to chat with us. An agent will be with you shortly. Info at 9:50, Jul 27: You are now chatting with AbdAllah. AbdAllah at 9:50, Jul 27: Hello, you’re chatting with AbdAllah, one of Talkmobile’s Help Team. How may we assist you today? Frank at 9:50, Jul 27: Need a new smaller SIM. Please send one. Thanks. AbdAllah at 9:51, Jul 27: Sure, no worries. AbdAllah at 9:51, Jul 27 We’ll check that for you straight away. AbdAllah at 9:51, Jul 27: For the security of the account, could you please confirm the full name, first line of your address and post code along with your date of birth? Frank at 9:52, Jul 27: I never give anyone I don’t know my DOB for security reasons, so you don’t have it anyway. AbdAllah at 9:53, Jul 27: We have it, of course, that’s why we asking as we want to make sure that we talk to the account holder. AbdAllah at 9:54, Jul 27: All chats are 128-byte SSL (Secure Socket Layer) encrypted. This helps to protect the confidentiality of all information provided. Frank at 9:55, Jul 27: No, you don’t have it. You might have a date but it won’t be my DOB. And this chat is TLS v3.0 encrypted. SSL has been defunct for a while now. Frank at 9:55, Jul 27: Is it perchance the first of january 1970? Frank at 9:55, Jul 27: The time zero on Unix? AbdAllah at 9:57, Jul 27: I quite sure that this chat is completely secured and there’s nothing to worry about, It’s a major company and out IT and data protection team are up to date. Frank at 9:57, Jul 27: Great! Frank at 9:58, Jul 27: However, it’s very unlikely I would ever have told you my real DoB. AbdAllah at 9:59, Jul 27: No problem. Frank at 9:59, Jul 27: So is it 1/1/1970? AbdAllah at 10:01, Jul 27: Actually, we have to pass the security questions first. Frank at 10:02, Jul 27: So it’s none of the above? Frank at 10:02, Jul 27: In which case it’s something random. AbdAllah at 10:02, Jul 27: Excuse me, we need to be accurate, please? Frank at 10:02, Jul 27: Try another question. How about payment details? Frank at 10:03, Jul 27: I DO NOT KNOW what DoB you might have for me. It’s not my real one. AbdAllah at 10:04, Jul 27: We can not go further before the security questions. Frank at 10:05, Jul 27: How about I call the bank and cancel the DD? AbdAllah at 10:06, Jul 27: Why? Frank at 10:06, Jul 27: I need to prove I am who I say I am, right? Frank at 10:06, Jul 27: Only I could cancel the DD. AbdAllah at 10:06, Jul 27: It’s all about your data protection, Mr Frank. 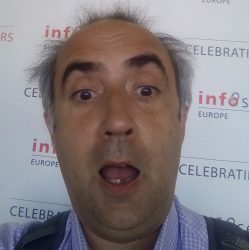 Frank at 10:07, Jul 27: You mean GDPR? AbdAllah at 10:07, Jul 27: Yes, exactly. AbdAllah at 10:08, Jul 27:I do apologize but if you do not answer the question we can not go any further. Frank at 10:10, Jul 27: So how do we get passed this point? Using DoB as ID is a very bad thing, as I’ve said may times. At this point their representative hung up so I called instead and spoke to someone reasonable, who sorted it out immediately using an alternative question. And someone who understood the implications herself! So I’m still happy with TalkMobile and I’ll probably be with them for another ten years. But someone really needs to sort out their GPDR training, and point out that it’s no blanket excuse.